Your FLAME&SHADE LED patio umbrella is manufactured from strong and durable powder coated aluminum and steel components to withstand the harshest elements. The premium 250gsm solution dyed polyester fabric is fade resistant and treated to inhibit mold and mildew growth. Using a PROTECTIVE UMBRELLA STORAGE COVER when your umbrella is NOT in use will help to extend the life of your purchase and assist to minimize the fading effects of prolonged UV exposure. The canopy is simple to open and close using the easy to operate crank winder. The umbrella features a handy 2 position push button tilt mechanisim to adjust the canopy angle with ease, providing superior all day UV protection for your family. You are sure to enjoy relaxing summer days on the patio under this beautiful FLAME&SHADE shade umbrella. · 1½" Powder Coated Aluminum Center Pole. · 8 Rectangular Powder Coated Steel Ribs. · Premium 250g Solution Dyed Polyester Fabric. To purchase the correct Protective Umbrella Storage Cover please search B06XTZ76YG. · Crank Winder to open and close. · 2 Position Tilt Function. · Central LED Hub Light. · Dual switching for rib lights and hub light. · Solar Rechargeable Li-Ion Battery 3.7V 2000mAh 7.4Wh. · Product Weight: 16lbs approximately. · Minimum Base Weight Requirement = 65lbs. To purchase the correct umbrella base, search B0795QPZ7P. If your situation requires extra ballast weight (over and above the suggested umbrella base weight set) to properly support the umbrella, it can be added by purchasing additional UMBRELLA AND GAZEBO WEIGHT BAGS search B0797FQMBM for further information. 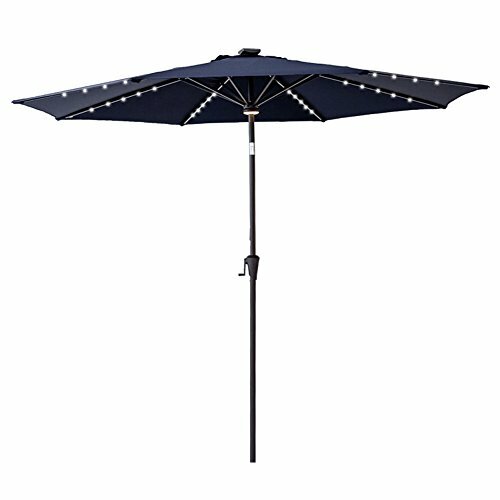 Tough POWDER COATED STEEL RIBS and ALUMINUM center POLE add strength and DURABILITY to this outdoor umbrella NOTE: The umbrella is not wind rated and must be CLOSED and SECURED in wind stronger than approx. 5 mph MAX. RELIABLE 2 position push button TILTING for ADDITIONAL SHADE OPTIONS. NOTE: The tilt function must not be used if there is any breeze or wind blowing. This market umbrella is ideal for freestanding use or over 4-6 seat outdoor tables. A useful VELCRO STRAP makes it easy TO SECURE the patio umbrella when closed, no difficult bows or knots required. To purchase a matching PROTECTIVE UMBRELLA STORAGE COVER search B06XTZ76YG. If you have any questions about this product by FLAME&SHADE, contact us by completing and submitting the form below. If you are looking for a specif part number, please include it with your message.